As the weather grows colder and the anticipation (or dread) of snow draws near, it’s the perfect time to discuss some cold weather safety tips for your pets! Most people are aware of the dangers that heat poses to your pets, but the cold weather has its own threats. Just like humans, all pets have varying tolerances of the cold weather. 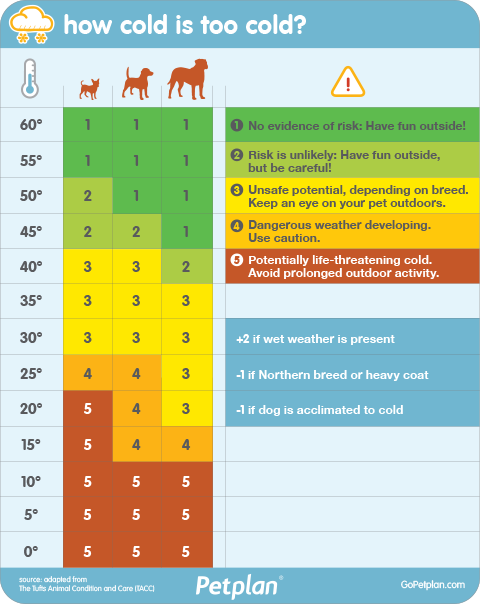 There are many factors to consider when deciding when it’s too cold for your pet. For example, a small, short haired dog will not be able to tolerate the cold as well as a larger, long haired dog will. However, that isn’t set in stone. All pets are not created equal and will all have different feelings about the cold! Be sure to watch your pet carefully to tell when it is just too cold for them. On the very cold days, it is best to shorten your walks with your furry friend. There are plenty of ways to exercise your pets indoor! Pets with arthritis or elderly pets can have a hard time walking on the snow and ice. There are some simple changes you can make to help your pets stay warm during the winter. If your pet typically sleeps on the floor, perhaps offer them a blanket or pet bed to sleep on. If your pet will tolerate it, you can put a coat or sweater on them, as well as booties on their feet, when taking them outside. Before bringing your pet inside from a walk or potty break, be sure to wipe down their paws, legs, and belly. Pets can get all sorts of dangerous chemicals on their bodies while walking through the snow and ice. Things such as antifreeze and deicers can pose a serious threat to your pet if ingested. Still not sure how cold is too cold for your dog? Here’s a helpful chart from Tuft University that may help guide you. As always, if you have any questions, Market Street is here to help! Stop by the clinic or call during business hours and we will be happy to help you and your pet enjoy the winter while staying safe and warm!